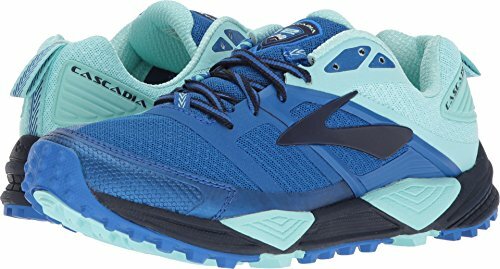 Kick up your heels and churn up the dust as you take to the wild outdoors in the Brooks® Cascadia 12 trail-running shoe! Predecessor: Cascadia 11. Support Type: Neutral. Cushioning: Lightweight, flexible response. Surface: Trail. Differential: 10 mm. Tight-knit mesh upper with synthetic and microfiber overlays. Structurally-supportive mid-foot saddle. Lace-up closure. Heel pull loop. Padded tongue and collar. Soft Element fabric lining offers a great in-shoe feel. Removable profile sockliner. Full-length S-257 Cushsole midsole compound utilizes an insole board for increased plush and flexibility. Trail-specific Four-Point Pivot Posting System technology supplies stabilizing suspension on both sides of the heel and forefoot. BioMoGo DNA midsole provides long-lasting cushioning, and features an environmentally-friendly build that breaks down 50 times quicker at the landfill, compared to similar midsole materials. Full-length Segmented Crash Pad features a caterpillar-inspired design that accommodates any foot landing for exceptional shock absorption. Durable thermoplastic EVA Ballistic Rock Shield placed between the midsole and outsole protects the forefoot by dispersing out point loads from sharp objects. Abrasion-resistant HPR Plus rubber throughout the outsole delivers long-lasting durability. Aggressive, high-surface area 3D Hex Lugs in the outsole promotes optimal multi-directional grip. Universal Sprung Platform. Imported. Measurements: Weight: 11 oz Product measurements were taken using size 8.5, width B - Medium. Please note that measurements may vary by size.